More than 50 projects characterizing critical variables such as groundwater geology, aquifer depletion rates, streambank stability and erosion, and climatic and atmospheric conditions. 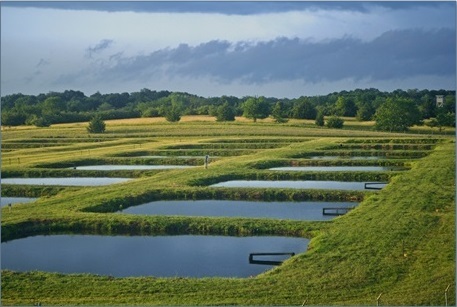 More than 40 projects exploring innovative technologies like wastewater treatment, nutrient recovery, urban stormwater management, and water infrastructure such as bridges and constructed wetlands. More than 30 projects focusing on knowledge and tools to advance flood forecasting, address reservoir sediment management, and improve water quality. The complex interactions of coupled human and natural systems at the heart of the water cycle require collaborative and interdisciplinary research that integrates human dimensions, engineering technology, climate science, and natural ecosystems. At KU these studies are supported by the Departments of Geology, Geography and Atmospheric Science, Civil, Architectural, and Environmental Engineering, Aerospace Engineering, Electrical Engineering and Computer Science, Ecology and Evolutionary Biology, Sociology, Economics, Mathematics, and the School of Law. Nearly 100 faculty are engaged in water-related research.